When Will I Get My 10x13 Envelopes? 5,000 and under 10x13 Envelopes: Ships or ready for pick up in 2 business days from proof approval. Over 5,000 10x13 Envelopes: Ships or ready for pick up in 5 business days from proof approval. When you need printed 10x13 envelopes, 48HourPrint.com delivers envelope printing that you can count on -- big time! You can trust that you are getting high quality 10x13 envelope printing that is big on value and satisfaction. 48HourPrint.com online envelope printing services are easy to use, very affordable, and focused on quality. Printed 10x13 envelopes create a BIG impression in delivering larger documents. There’s no denying the commanding presence delivered by 10x13 envelope printing. 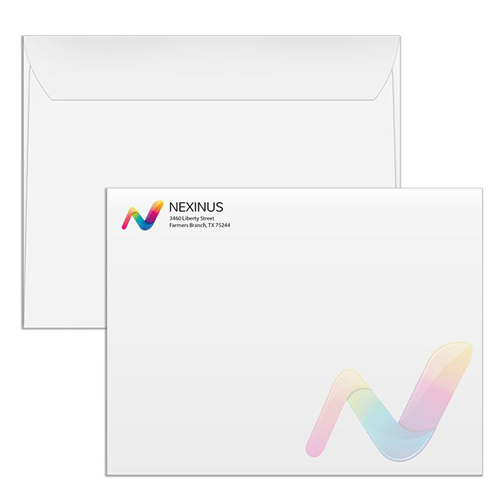 Include your full-color logo, tagline and return address on our 10x13 envelopes and you have an attractive, versatile tool for mailing or delivering documents. And using 10x13 enveloping printing helps your company or organization stand out from the pack. In addition to 10x13 envelope printing, our online envelope printing services include #10 envelopes, #10 window envelopes, #9 envelopes, A2 envelopes, A6 envelopes, A7 envelopes, A9 envelopes, and 9x12 envelopes. All of our 10x13 printed envelopes are full color one side and are printed on laser and inkjet printer-compatible paper stock.